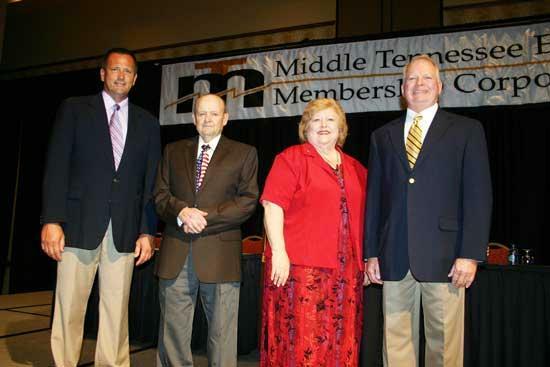 Middle Tennessee Electric Membership Corporation members re-elected four incumbents to their board of directors seats during the cooperative’s Annual Meeting Saturday at Embassy Suites Murfreesboro - Hotel and Conference Center. Incumbents Charles Bowman, Gloria O’Steen, Dan Smith and Mike Woods won re-election to their seats. In Williamson County or District 1, O’Steen collected 525 votes. She ran unopposed. O’Steen holds one of three seats for MTEMC’s District 1. For the Rutherford County or District 2 seat, Woods collected 528 votes and ran unopposed. There are a total of three MTEMC board seats representing Rutherford County. For the Cannon County or District 3 seat, Bowman also ran unopposed and collected 507 votes. In the Wilson County or District 4 seat, Smith defeated Ken Griffith of Liberty by a 596-441 margin. There are a total of four MTEMC board seats representing Wilson County. The annual meeting, held at Embassy Suites Murfreesboro - Hotel and Conference Center, completed a week-long opportunity for the cooperative’s members to vote for their board representatives. On Aug. 16-20, members could vote at their local district office. In an organizational meeting following the voting, the board re-elected Wilson County’s Gordon Bone as chairman, and then elected Will Jordan of Rutherford County as vice chairman and Mike Woods of Rutherford County as secretary-treasurer. In addition, Charles Carter of Fairview won the grand prize — a used 2006 Chevy Colorado pick-up truck. Approximately 1,200 people attended the meeting. As part of its bylaws, MTEMC has held a members’ meeting every year since the not-for-profit cooperative was organized in 1936 by a group of Middle Tennessee citizens.